EVENING SKINCARE ROUTINE | in style of Emily. When it comes to skincare I like to keep things as simple as possible because I don't want to overdo it with products on my face, especially in Spring/Summer time. When I was about 12years old, I started to get problem skin and used to break out regularly just because it was the start of the teenage years and also because I didn't use any skincare really. But now that I'm a bit older, I've realised the importance of having a good skincare routine both morning and night, and spending time on finding products that suit your skin. My skin is now mostly clear with the very occasional breakout, but even then, it won't last long at all. I am really happy with the skin care products I'm using right now and I've had this routine for a while now so I thought I'd share it with you. I'm going to split this up into two blog posts with this one being my evening skincare routine. At the end of the day when it comes to my first cleanse, I use the Garnier Micellar Cleansing Water to take off my makeup. This is really gentle on the skin and is great at taking off all traces of makeup including waterproof mascara, and the bottle lasts for ages. Time for the second cleanse. 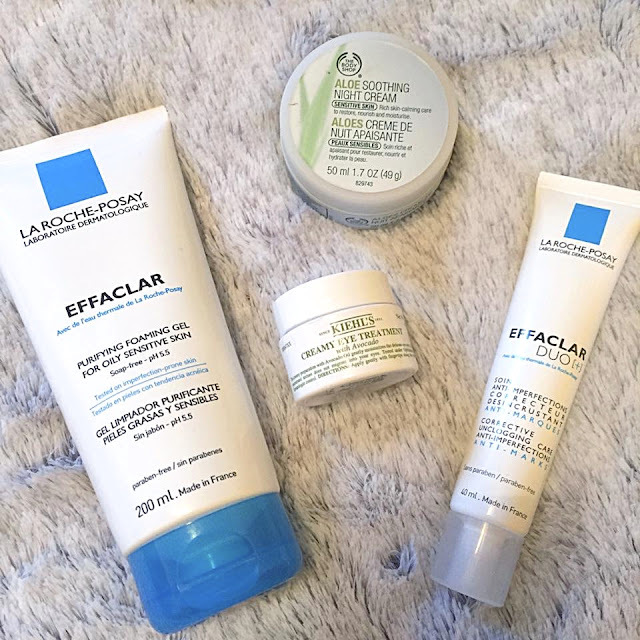 After removing my makeup I like to cleanse my face with the La Roche-Posay Purifying Cleansing Gel which is a lovely gentle cleanser designed for oily/combination skin. This leaves my skin feeling so clean, fresh and smooth. I usually work this into my skin for a minute or two with circular motions and remove with a damp face cloth. I like to apply the La Roche-Posay Effaclar Duo Anti-Marks Serum which helps to reduce any blemishes and marks left on the skin from previous breakouts. It's really helped to even out any dark pigmentation on the skin and leaves the texture smooth. You can either apply this all over the face or apply it to certain problem areas which is what I like to do. Eye cream is something that is quite a recent development in my skincare but I've been using the Keihls Creamy Avocado Eye Treatment which is really hydrating around the eye area leaving your eyelids feeling super plump and pampered. It's quite thick and so a little goes a long way but its very cooling which is a nice calming feeling before bed! 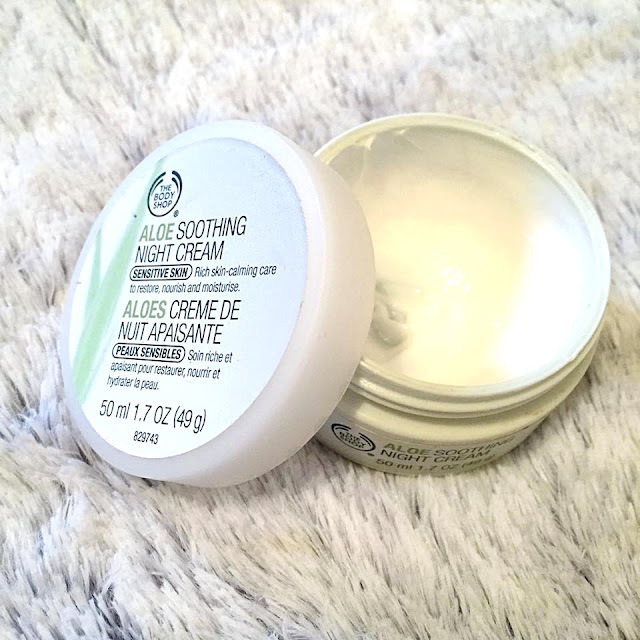 For my night time moisturiser I like to use something calming and cooling on the skin to make me feel refreshed for the morning and the one that is my current favourite is the BodyShop Aloe Soothing Night Cream which is designed for sensitive skin. 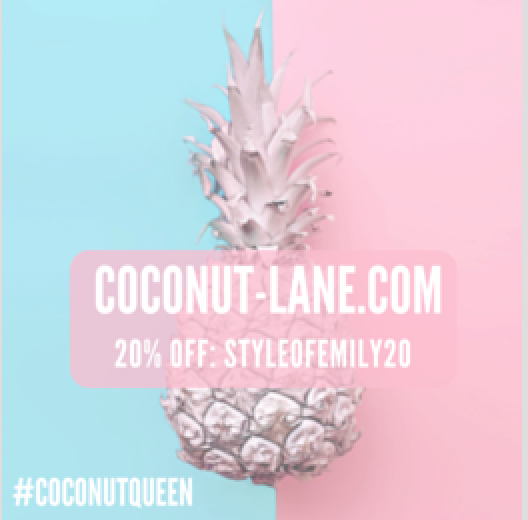 It's very hydrating and contains natural ingredients and leaves my skin feeling very healthy and smooth. Sometimes I like to use a face mask once or twice a week to give my skin a bit of a pamper and treatment and the ones that I like to alternatively use are the Liz Earle Deep Cleansing Mask which is a clay mask or the Sanctuary Spa Beauty Sleep Face Mask which is a gel formula. 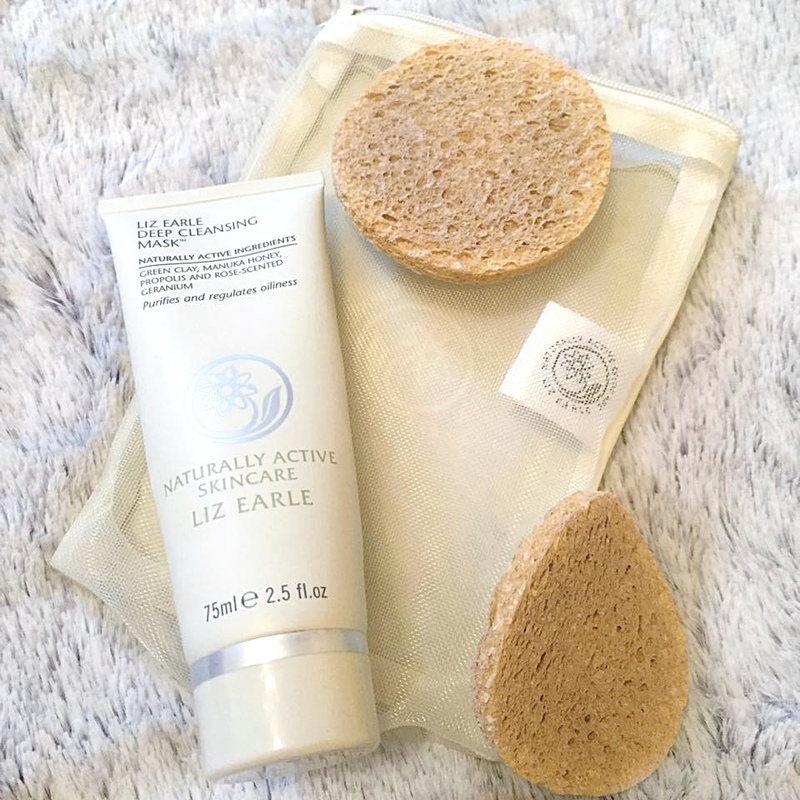 The Liz Earle face mask is one that I use if I'm having a breakout or my skin isn't looking its best and the Sanctuary Spa one I use if my skin is feeling uneven or dull as it helps to brighten and soften skin. I hope this has given you a few ideas about evening skincare if you're looking to try some new products, but obviously my skin type isn't the same as everyones which means that not everything I use will work for you. Keep your eyes peeled for the next instalment which will be all about my daytime skincare routine.